Seriously, that is a major pet peeve of mine. “Alright” is not a word. “All right” is how you spell it. 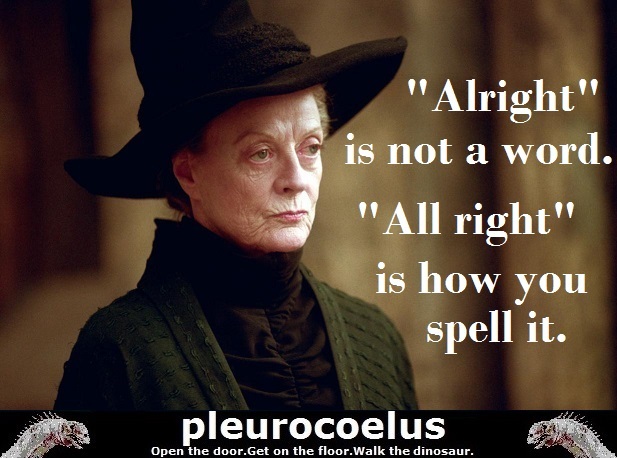 This entry was posted in writing tips and tagged harry potter, writing tips on February 17, 2015 by pleurocoelus. Writing various scenes for the remaining chapters. Working on the sequel. This is the sequel. Working on the first chapter. Outlining first timeline (up to the time travel event). This entry was posted in Uncategorized and tagged in progress, new, story on January 20, 2014 by pleurocoelus. Ever have trouble remembering the difference between baited and bated? Crookshanks ate some cheese then waited for Scabbers with baited breath. This entry was posted in Uncategorized on January 20, 2014 by pleurocoelus. After all, he is a Parselmouth. 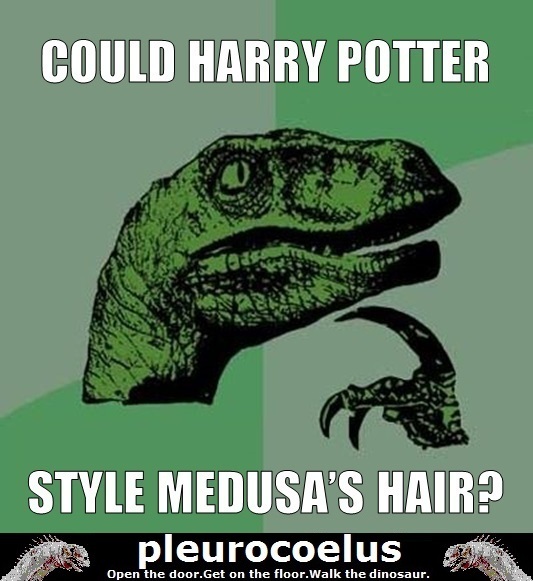 This entry was posted in Uncategorized and tagged harry potter, medusa, parselmouth, parseltongue, philosoraptor on January 19, 2014 by pleurocoelus. I recently read this article about using prologues. It was very helpful. Personally, I always read the prologue. I agree that if one cannot pull off a decent prologue, one should not use the device. If a prologue and first couple of chapters can’t grab my attention, then I will back out of the story. I don’t understand the bias against the device, though. Yes, there are plenty of bad examples of prologues, but it’s a perfectly useful device in the proper hands. To refuse to read them ALL doesn’t make sense to me. Regarding the prologue/first chapter of Harry Potter and the Philosopher’s Stone: I think it’s a case of semantics. It is essentially a prologue, even in JK Rowling declined to call it such. A rose by any other name would still smell as sweet. A well-written prologue will work no matter whether you call it a prologue or a chapter. By the same token, a poorly-written example will fail, regardless or what it is called. Info dumps should be folded into the story when possible. Alternatively, a separate information section would suffice. Since I read mostly science fiction and fantasy, I am quite used to books containing “Dramatis Personae” listings as well as maps, glossaries, timelines, family trees, and other useful extras. JRR Tolkien, Anne McCaffrey, Larry Niven, and a host of other well-loved authors use such sections to great effect. Of course, these days, the author can place much of the supporting information online, as JK Rowling has done. Regarding the aforementioned subject of fanfiction: Theodore Sturgeon once observed that “ninety percent of everything is crap. ” While that assessment may be incredibly generous where fanfiction is concerned, I still feel obliged to defend it. I read fanfiction for many reasons, one of which is that it is free. Of course, I do get exactly what I pay for in that scenario. That being said, I have found a few jewels of creativity, even if they are encased in the rock of poor writing skills. I should also mention that I write fanfiction. I bear no illusions that I will ever become good enough in my writing to do so professionally. The market is quite oversaturated these days and I don’t have the time to properly develop my skills. Writing fanfiction gives me an outlet for my creativity and the chance to perhaps improve in my ability along the way. If I give enjoyment to a few readers along the way, so much the better. The author was kind enough to respond, as well. This entry was posted in Uncategorized and tagged prologue on December 17, 2013 by pleurocoelus. The “My Stories” page has been updated to reflect my two completed stories and two in-progress stories. Each story now has its own sub-page. “On a Mission from God” has two chapters remaining before it is complete. “Cave of Second Chances” has just begun and will be running for a while. I don’t have a master plan on the number of chapters and my chapters aren’t long so far, but this is my first long story. It’s a time travel story. In the original timeline Draco befirends Harry, but it is a deception. After Voldemort returns in Harry’s second year, war erupts. Eventually, Harry discovers a means to relive his life. I’m trying to make it different from the other time travel stories I’ve read. This entry was posted in Uncategorized and tagged in progress, new, story on December 17, 2013 by pleurocoelus. I just published A Squirrelly Thing Happened on the Way to the Burrow. My current project is a soul bond fic with sci-fi leanings. Expect tongue-in-cheek references to various sci-fi movies. That one is still in progress and quite stalled. Other stories have been posted in the meantime. This entry was posted in Uncategorized and tagged complete, harry potter, hp/gw, in progress, posted, soul bond, story on April 14, 2013 by pleurocoelus. I am a man with dark hair and green eyes. I wear glasses. I have a scar on my forehead from an encounter in my early childhood. Of course, my hair is brown, not black; my glasses are rectangular, not round; and the scar is from a piece of furniture, not a Dark Lord. For some bizarre reason, I have taken it upon myself to increase the number of fanfics on the interwebs. Sheer insanity.